This home owner has a young family and a home office, so the electricity use at home in the day time was quite high. 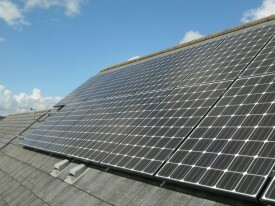 He wanted to save money on his energy bills as well as make a long term investment by installing solar panels. 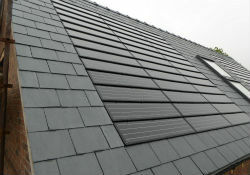 This Swansea homeowner wanted solar panels to generate electricity and was keen to use as much of the self-generated electricity as possible within the property, minimising the amount that is sent back to the grid. This West Midlands property was being extensively renovated, including a completely new roof. 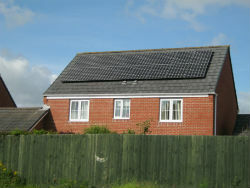 The owner wanted a roof-integrated Solar PV panel system to compliment the aesthetics of the property. Careful planning to maximise the size of the system was required due to the positioning of dormer windows, shading and limited roof space. This Swansea homeowner, viewed solar as ethical investment, which would provide a return whilst also supplying him with free electricity. He was also interested in monitoring the panels performance using a web portal. EnergyMyWay carried out a survey of the property and made recommendations on the most appropriate system. 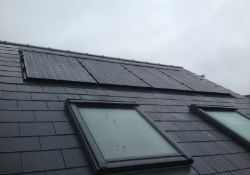 The owner of this Swansea property was interested in solar PV panels as a way to add value to his property whilst also investing for the long term. 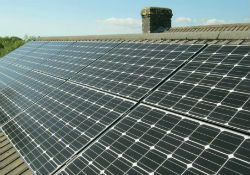 He approached EnergyMyWay who carried out a survey of the property and assessed its viability for solar panels. 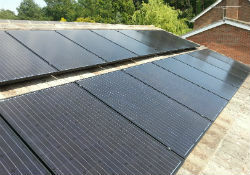 This Staffordshire home owner approached EnergyMyWay wanting a high energy yield from Solar PV Panels, as the property’s electricity use was due to increase with other planned improvements. We recommended looking at a system that will contribute to hot water production as well as electricity, to give less reliance on the grid and to future-proof the property . 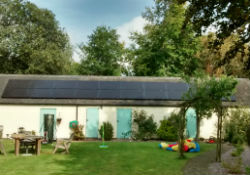 The owner of this rural property in Cheshire was attracted to the environmental benefits and financial returns of solar, but did not like the look of conventional solar panels. As specialists in a wide variety of attractive solar solutions, EnergyMyWay were invited to review his plans for a new garage building he was developing and to propose a solution that was aesthetically pleasing and in keeping with the overall design of the building. 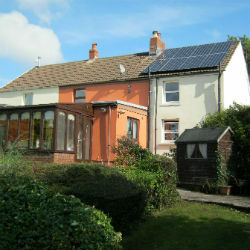 The owner of this listed property was interested in renewable energy and approached EnergyMyWay for advice on their options. We considered biomass, but this was rejected by the planners, and heat pumps were not a practical option. 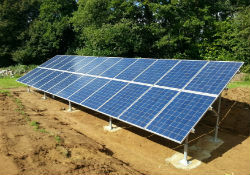 However we were able to specify and install a remote ground mounted solar panel system, positioned and landscaped to meet planning expectations.